Ayres is outstanding as composer, arranger, editor and skilful player. . . this CD is undoubtedly one of the most enjoyable and original recordings I've heard. In truth, there isn't a dud track here and Paul Ayres' playing is consistently well judged. This is a recital which has lifted my spirits each time I have listened to it! This CD features a varied collection of pieces, many recorded for the first time. There are examples of GFH’s music originally written for organ, and arrangements of well-known instrumental works. 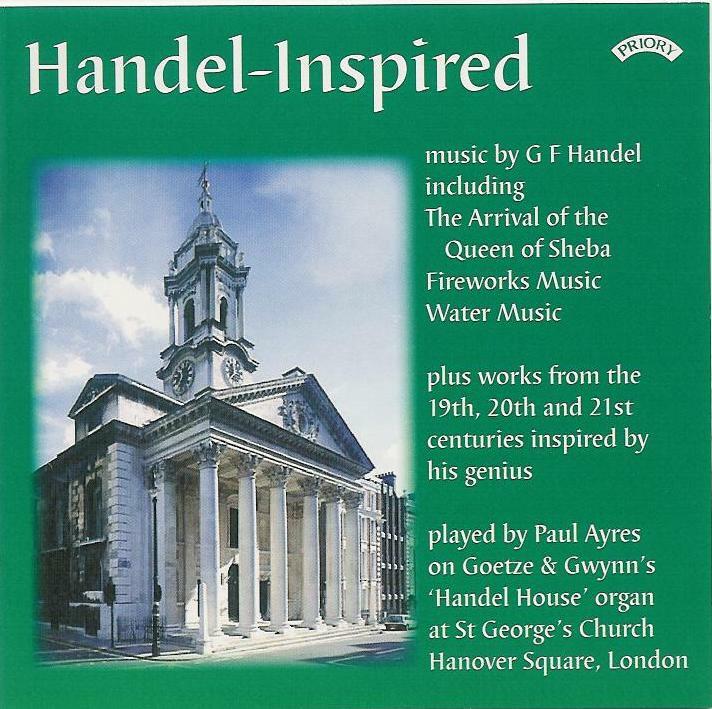 Complementing the genius of Handel (who regularly attended St George’s Hanover Square) are composers who have been ‘Handel-inspired’, including Samuel Wesley, Alexandre Guilmant and William Wolstenholme. Then there are eight brand new works selected from the 98 international entries to the Handel-Inspired Composition Competition, generously supported by the Hinrichsen Foundation and by the Kenneth Leighton Trust. Full track listing below. The music is played on the 1998 chamber organ (one manual, no pedals) by Goetze and Gwynn, a reproduction of a mid-eighteenth century instrument owned by Charles Jennens (‘librettist’ of Messiah), commissioned by the Handel House Museum. Specification below. THE ORGAN was made for the Handel House Trust, which in 2001 opened a museum in the house where Handel lived for the last 36 years of his life: 25 Brook Street in Mayfair. The instrument is based on the chamber organs of Richard Bridge and Thomas Parker, who built the organ which belonged to Charles Jennens, which still exists close to its original condition. The key compass is 54 notes (GG AA C D - e³). The metal ranks are all divided into bass and treble halves at c¹/c#¹. There is a shifting movement pedal which removes the metal ranks (if drawn). The pitch is a¹=415Hz. The wind pressure is 51mm. The organ is 263cm high, 141cm wide and 75cm deep. It has a stained oak case, with gilded dummy metal front pipes, and a gilded cherub's head. The keys have ebony naturals and sandwich sharps. The stop knobs are ebony, next to engraved brass labels.